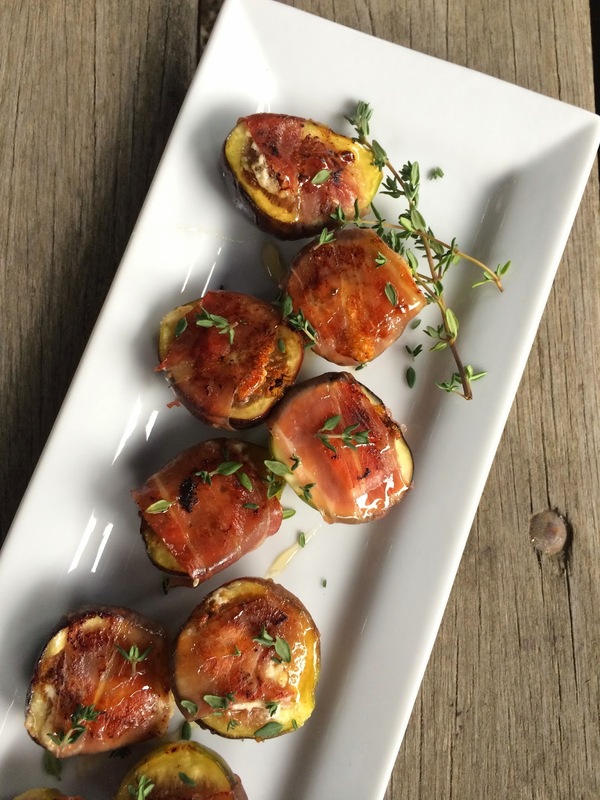 This combination of figs and Prosciutto might be one of my favorite summer bites. Quick to come together and easy to serve. Every chef and cook I know is making some variation of this at this time of year. The only difficulty I usually have, is grabbing them at the Farmer's Market in the short window of time they are available. This summer it seemed they were only around for a couple of weeks - and only being sold by a few farmers. I, of course, scooped up whatever I could get my hands on and served them every chance I had. This appetizer started our most recent TK dinner. I did some with Goat cheese and some with Parmesan cheese. I like both although usually I prefer the hard cheese. These were pan fried in the one non-stick pan I own (was just easier) Then finished with a drizzle of wildflower honey, fresh pepper and thyme. Slice all the figs in half lengthwise. Slice all your prosciutto so you have long thin pieces. 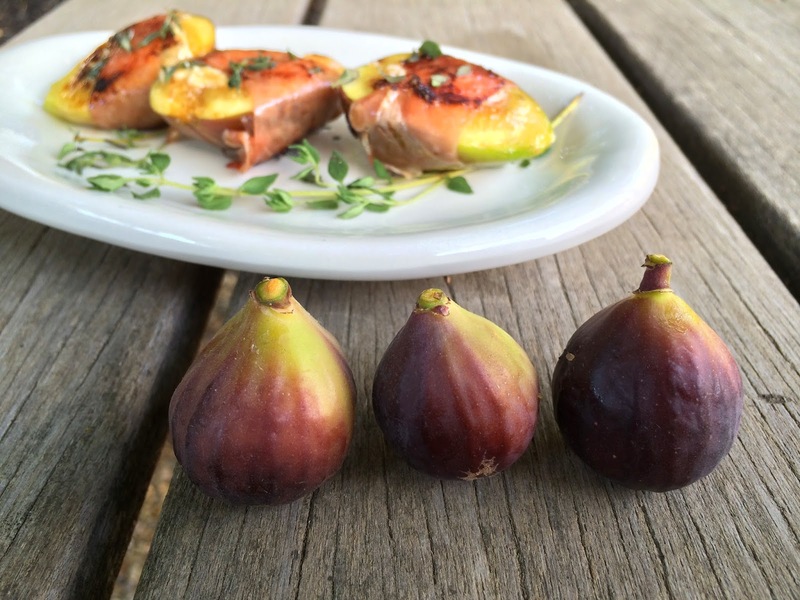 Pick your cheese then put a small piece right in the center of each fig. 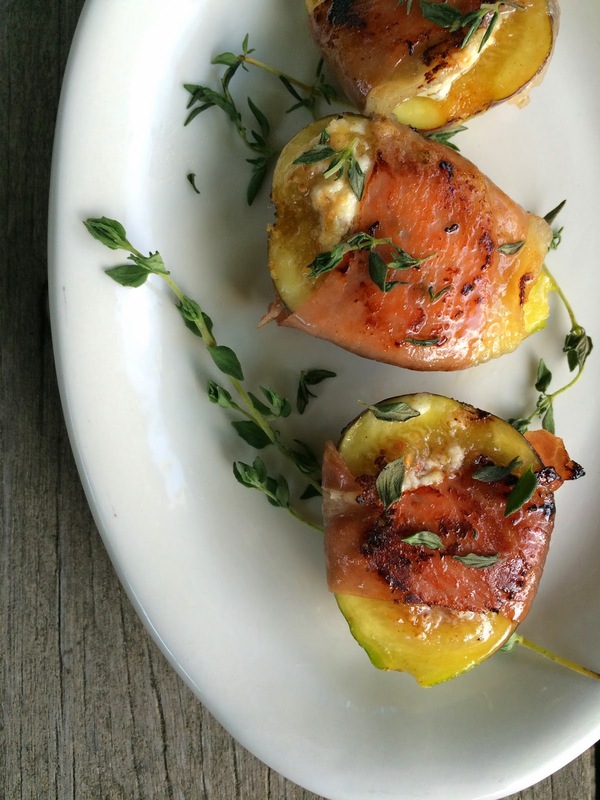 Wrap each fig/cheese segment with Prosciutto. Pan to medium/medium high heat. Place several bites in the hot pan with the seam side down. Doing this side first helps to keep the fig wrapped and everything looking pretty. Cook just until the prosciutto is crisp. Remove to a plate lined with a paper towel. When ready to serve, arrange as many pieces as you can onto your serving platter. Drizzle with a scant amount of honey. Add pepper then finish with the thyme leaves. The following photo I am adding because these were the tiniest, cutest figs I've ever seen! Probably about the size of cippolini onions. So cute!